The emerald waters and charming coastal towns along the Mediterranean have an unmistakeable allure, offering the chance to live la dolce vita, if only for a brief time. More so if you’re about to tie the knot, and are looking for the perfect destination to unwind and spend quality time with your beau before pulling off your very own big fat Indian wedding. The problem happens when you’re all set to work on your tan, in between visits to vineyards, picturesque forts and relaxed cafes, and your fiancé has a drastically different agenda, one that involves a road trip mixed with equal parts hiking and scuba diving. Finding this magical place may seem harder than finding the man or woman of your dreams, but there is one region that promises all the greatest hits — pristine white beaches, quaint hillside towns (complete with cobblestone streets) steeped in history and Michelin-starred cuisine — within an incredibly manageable footprint. This is Corsica, just a hop, skip and jump from Paris, and it welcomes sun worshippers and thrill seekers alike to its shores. 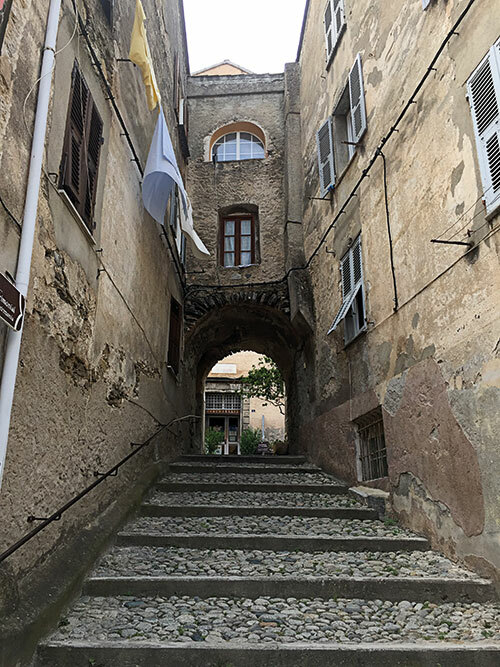 Formerly ruled by the Genoese, this French island south of Nice never lets you forget that it was once an Italian stronghold — in fact, it’s so close that even the car’s radio gets confused from time to time, cutting out to the odd Italian station in between French pop songs. 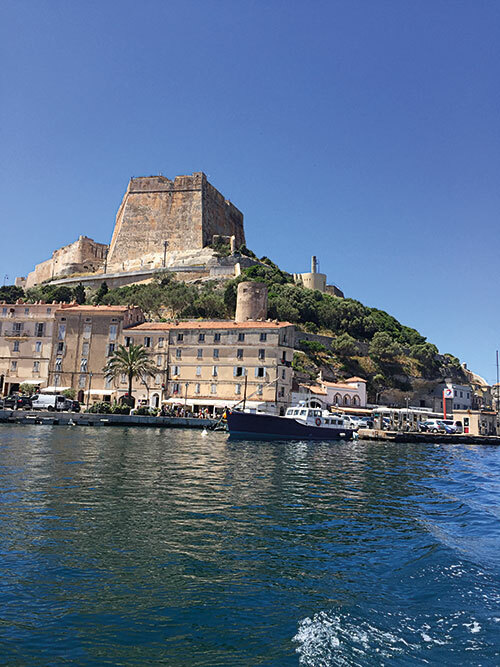 Though French is widely spoken, so is Corsican, a closer cousin of Italian. Similarly, the food is a delicious amalgam of both cuisines. Wine, cheese and charcuterie are in abundance, along with variations that celebrate locally grown ingredients — such as fig, chestnut, cedrat (an intense citrus) and myrtle berry. Coupled with the ever-changing scenery that rapidly oscillates between forests and bucolic farmlands, fierce mountains and the laid-back seaside, all you can do is give in to this feeling of being lost on an island that time and the rest of the world seem to have forgotten. Venturing south from Bastia deep into the countryide, you come across the vegetation, which is called maquis by locals and known for its fragrant mix of lavender, rosemary and immortelle flowers that make you leave all your cares behind. All around the twisting roads soar immense, jagged mountain ranges. 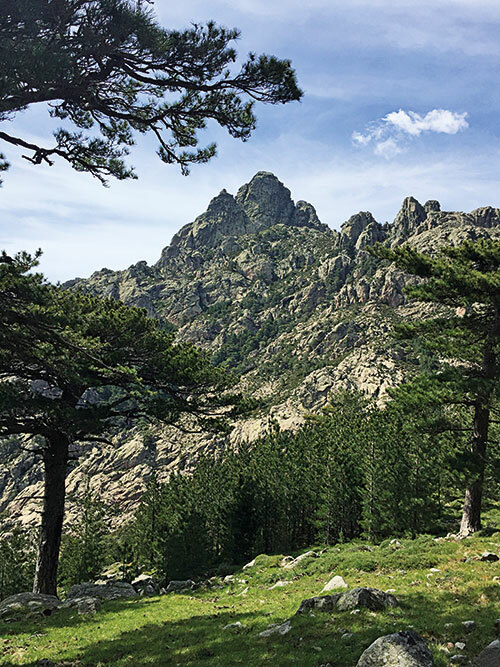 It’s no wonder that Corsica is called a mountain in the sea, with its snow-capped peaks that give way to waterfalls and streams, filled with walking trails and secluded spots for an impromptu picnic. For serious hikers, there is also the infamous GR20 (Grande Randonnée 20), considered to be Europe’s hardest long-distance trek. Driving through the mountains also offers glimpses into Corsica’s rustic past. 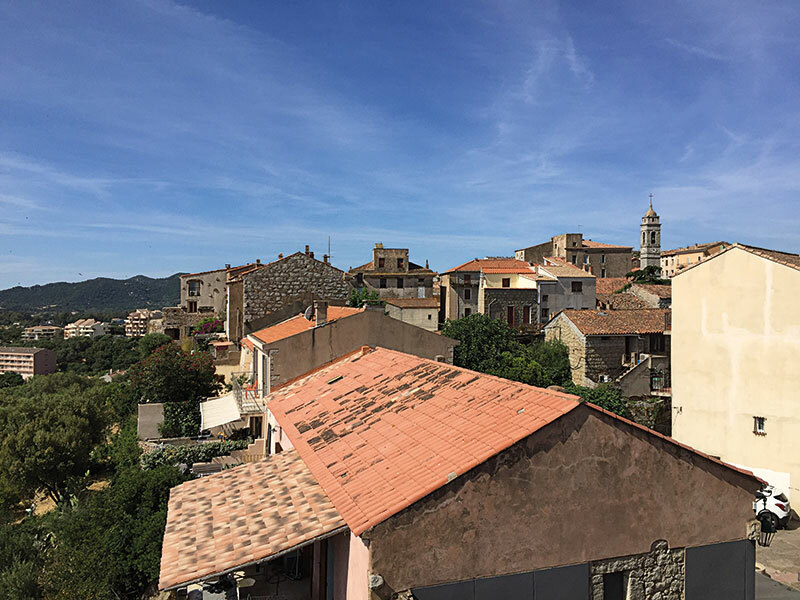 Life in former capital Corte or Sartène, the ‘most Corsican of Corsican towns’, seems to move exactly as it did centuries ago — at a glacial pace. Corsicans are traditionally a mountain people and though most of the younger population has moved down to the coast, many keep second homes in the hills where they can retreat to in the hotter months. Strolling around the narrow streets and hamlets is like entering a medieval time warp. Of course, no holiday is complete without a few days spent luxuriating alongside azure blue waters. Here rugged cliffs quickly give way to a stunning coastline dotted with secluded coves that offer complete solitude. Porto-Vecchio makes for a good base to explore the sun and sands of the southern region, with plenty of designer boutiques and cafes within its ramparts and the best beaches a short drive away. In other words, experience the French Riviera without having to elbow your way through millions of tourists. The jewel in Corsica’s crown is Bonifacio at the southernmost tip, sitting resplendent atop a cliff that has been carved over centuries by wind and water. A picture-perfect harbour lined with yachts and brimming with restaurants, cafes and shops through cobblestone streets to the oldest town in Corsica makes for a day well spent. More than anything though, it boasts sunsets that are to die for, quite literally. Once at the top, head towards the cimetière marin. 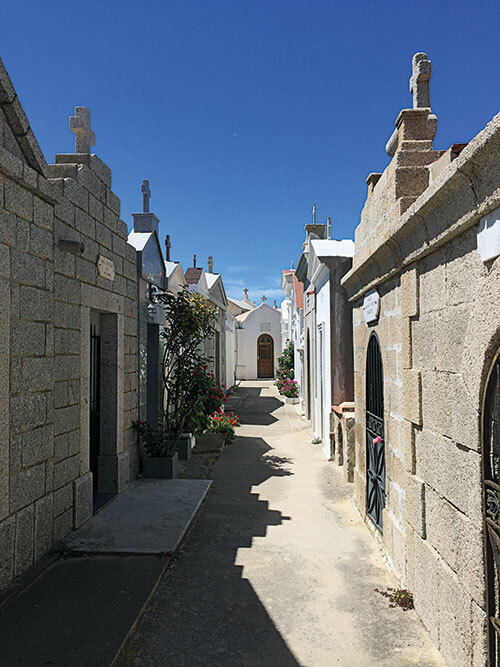 Surrounded by the Mediterranean below — with neighbouring Sardinia close enough to touch on a clear day — this pretty cemetery by the sea contains family tombs and mausoleums ornately decorated like real houses and arranged along streets. But the magic really comes alive when you take to the water. The ancient town, with its pastel-hued medieval architecture, presiding over sheer alabaster white cliffs makes for a dramatic image. Once you’ve filled your camera’s memory and captured the vistas from every possible angle, set anchor at any of the adjoining beaches and take a dip, or go jet-skiing or snorkelling in search of red gorgonian coral. Corsica feels untouched and wonderfully authentic. It’s a place that makes you feel like you’re the only two people on earth (but with all the comforts of room service and infinity pools, obviously). No noisy tour buses have invaded its shores yet, but owing to its relatively undeveloped nature, it can be a little daunting to find one’s own way around. Air France operates frequent non-stop flights to Bastia from the Charles de Gaulle airport. Put yourself in the capable hands of Henri de Rocca-Serra, from Corsica Napoleonica, who will help curate a customised honeymoon that checks all your boxes. 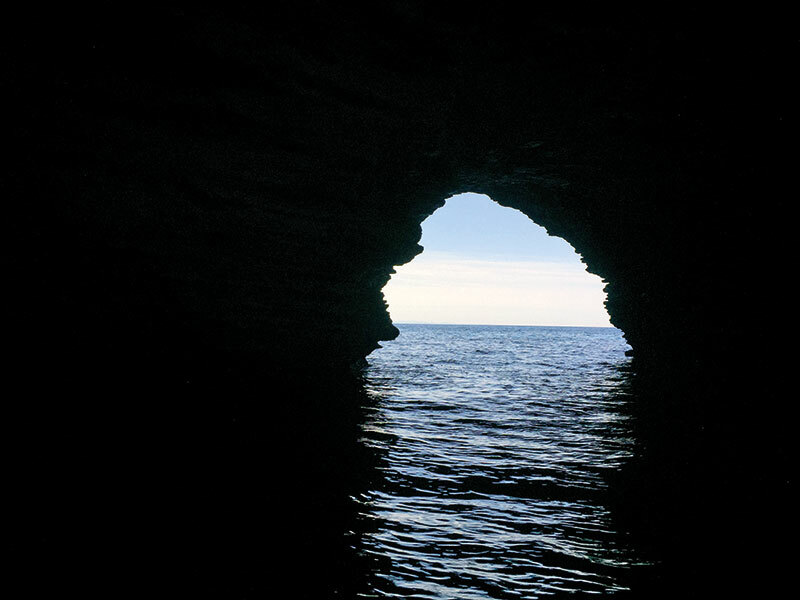 And do allow some room for the wilderness of this unique little island to take you by surprise.